Emory University President Claire E. Sterk has charged a search advisory committee with the recruitment and identification of the most highly qualified candidates for Emory’s next university chaplain and dean of spiritual and religious life. The search advisory committee — chaired by Robert M. Franklin Jr., senior advisor to the president and the James T. and Berta R. Laney Professor in Moral Leadership — will work with the Emory community to identify a slate of leading candidates for Emory’s university chaplain role. The optimal candidate will be both a practitioner and a scholar who embodies the role of “chief caretaker,” and who brings an exceptional level of experience working with university and interfaith partnerships. The search advisory committee will identify and interview applicants throughout the first quarter of 2019 and will present three finalists to the president, with the expectation that Emory’s next chaplain will be identified during the spring semester. The Office of Spiritual and Religious Life (OSRL) at Emory University provides varied and rich opportunities to enhance the religious and spiritual life of members of the Emory community in a variety of ways, including creating and sustaining community, encouraging multi-religious service and outreach, and supporting the Emory community in continuing ethical and spiritual formation. OSRL partners with a team of tradition-specific chaplains, religious life advisors, and campus ministers to support a wide range of student religious groups recognized by the university. The OSRL provides oversight of Cannon Chapel, which was consecrated in 1981. 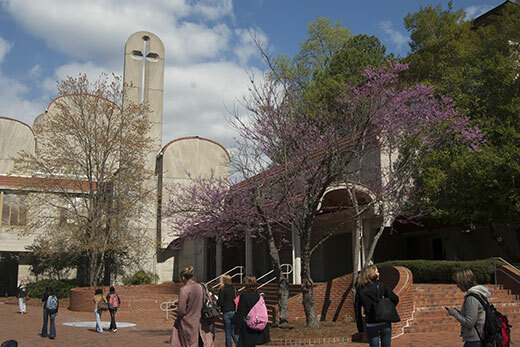 Named for William Cannon, a former dean of Candler School of Theology and later a bishop in the United Methodist Church, the building houses the office of the University Chaplain, Candler School of Theology’s offices, and academic space. The office works with religious life staff representing various religious traditions on Emory's Atlanta and Oxford campuses to develop an extraordinarily diverse religious life program on Emory’s Atlanta and Oxford campuses. Hallmark programs include Journeys, the Inter-Religious Council (IRC), International Student Coffee Hour, and Off the Record.